ProsDurable, good chain fit. No flex. Have ridden about 10k miles with this chain ring (42T) on a bike with Rohloff hub. Rear sprocket std 16T. Hardly any wear at all on this ring. I do use a Hebie chain cover though which keeps the chain nice and clean. Also negligible chain wear as well - KMC X1. It is good that this chain ring is thicker so the chain sits a lot snugger on the teeth but the down side is that being thicker the Hebie Chainglideris a little too tight for it so has worn away half the surface of the chain ring where the Thorn logo and ring details are written 7075T6/42T so you can just about still read them. I'm running these chainrings on both my hub geared recumbent trikes & also a fixed gear bike. The tooth profile is perfect. It engages smoothly but is deep enough so that on my trikes I don't need any chain management to prevent chain dumping on bumpy high speed corners. It also means that you can run the chain aa little more slack of fixed gear for an even smoother pedal motion. They also absolutely refuse to warp even after 10k miles of use even on a log chained trike with high chain tension. My issue with them is that after 10k miles they're worn out on both sides. With my fixed gear bike this perfect as you swap the direction of the chainring for its second chain & sprocket pair at 5k miles. However, with a 270 link chain this limits chain life to about 10k miles, with stainless chainrings I get 15k out of a chairing/chain/sprocket set. ConsOther colours would be nice. This is the third Thorn chainring I have bought, with more teeth as my leg strength improves. Good strong part, would like colours other than black for road use just 'cos it's more on trend. Good value. I altered my sprocket and chainring to get gear 11 just right for level road fully loaded riding. The old chainring looked perfect after a couple of thousand miles. The replacement is a duplicate apart from having more teeth. Easy to fit, especially with a chainring bolt spanner to hold whilst tightening the other allen key end of the fixing bolts. Can I use this on a Brompton 6 speed? Yes this will work on a Brompton. Will this fit on an FSA Vero 110mm spider? I'm looking to do a simple 1x conversion of my 2014 Trek 7.6 FX. It's fitted with a 50/34 FSA Vero crankset. Can I install this on the same spider? Hi there, do you have 36T of this chain ring? I only see 38T and 36T on your website! Thanks! 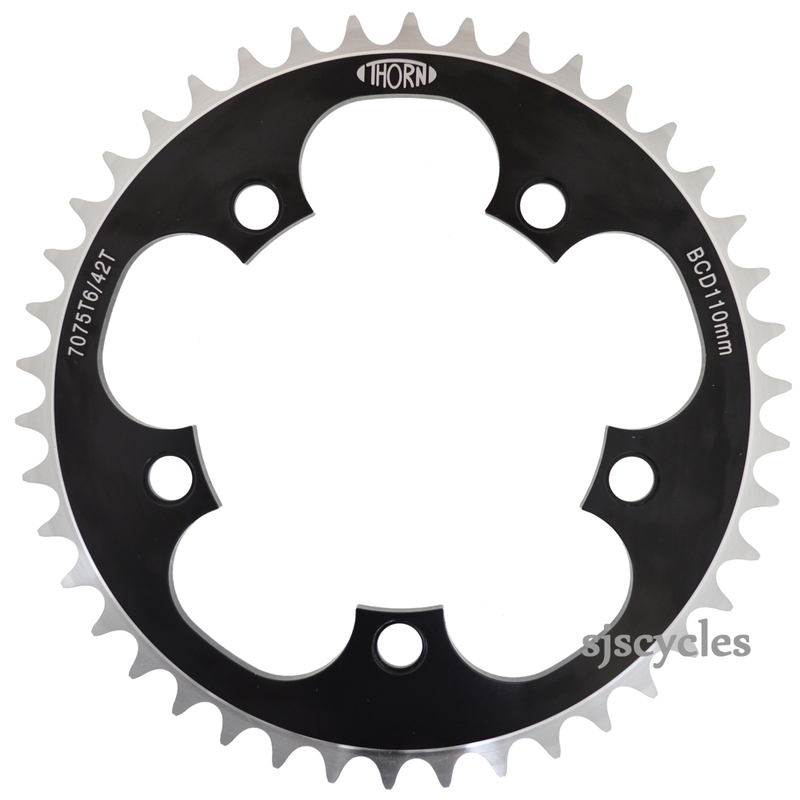 We do have the 36T version of this chainring available, you can select this size from the drop-down menu. Would This Be Ok For A 1 X 10 Road Setup ? Unfortunately this chainring would not be suitable, this chainring is designed for 3/32" chains which are a much wider gauge than 10spd chains so a 10spd chain would not sit properly onto this ring I'm afraid.